One of my favorite non-vegan dishes to make is white chicken chili. Creamy cannellini beans, a dash of cornmeal and green hot pepper sauce are perfect accompaniments to this hearty stew that I can’t wait to make once the leaves start to change color and there’s a chill in the air. I’ve wanted to share this recipe with my husband, but sadly, it’s always been a solo affair. While the rest of the soup could easily be made vegan, there just hasn’t been a good substitute for chicken. Putting in tempeh isn’t similar at all (taste or feel), tofu isn’t the right texture, and I’ve never been a fan of Gardein (close, but not convincing enough to the real thing that I’d want to eat it). Enter Beyond Meat, the new so-close-to-chicken-it’s-scary product I’ve been raving about, and suddenly, I’ve had the chance to transform all of my favorite previously-can’t-make-vegan recipes into delectable delights that both of us can enjoy. 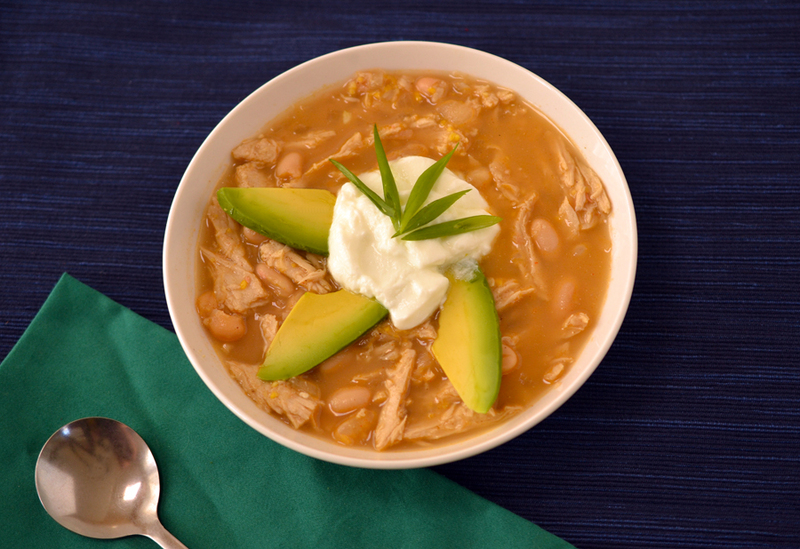 I hope you enjoy this recipe for white ‘chicken’ chili! You may have noticed that salt isn’t listed as an ingredient – this is on purpose! While it’s easy to find low sodium chicken broth, it’s a lot trickier to find fake chicken broth that doesn’t taste like a salt lick. The only brand I’ve found period that actually tastes like chicken broth is the Better than Bouillon “no chicken” product, and it’s damned salty. I suggest making the soup without ANY extra salt, then add some at the end only if necessary. It’s an ingredient that’s easy to add, but impossible to remove. I like chili that’s a little bit brothy – if you like it super thick, use 2 cups of broth instead of 3. It’s always easy to add more at the end if needed. I personally love this soup with a generous helping of greek yogurt – if you go that route, make sure you get a mediterranean or higher quality brand. I’ve purchased generic store brands (like Kroger) which are sweet, and that is NOT a flavor you want in this dish. One Comment on "Vegan White “Chicken” Chili recipe with Beyond Meat"